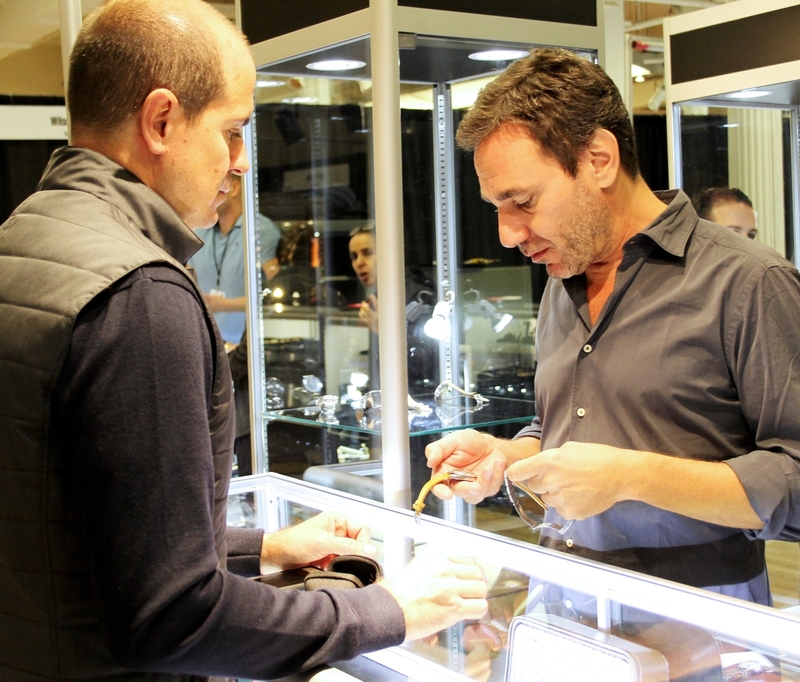 NEW YORK CITY – There was a lot of bling, but no glitzy preview to kick off the New York City Jewelry & Watch Show. Never mind, this Palm Beach Show Group event did not need one. From the moment the show opened at the Metropolitan Pavilion in Chelsea on Friday morning, October 27, crowds were steady and selling was strong. Organizers put attendance at 5,000 visitors during fair’s four-day run. 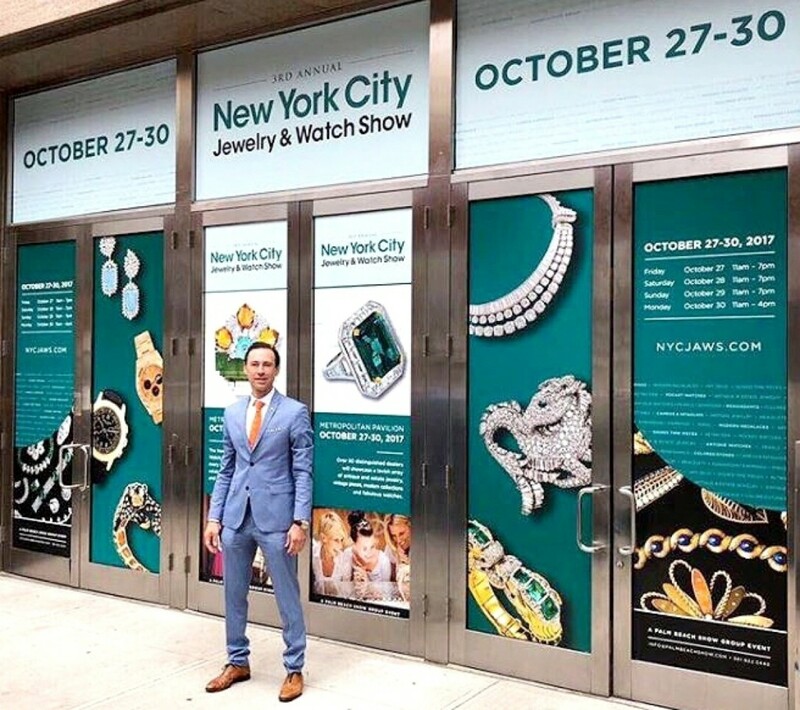 Palm Beach Show Group president and chief executive officer Scott Diament at Metropolitan Pavilion for the start of the New York City Jewelry & Watch Show on October 27. This is one place where shoppers, many of them dealers themselves, appear to know what they are doing. There was a palpable buzz on the floor as colleagues greeted one another, along with frequent interruptions as merchants stopped to write up sales. Under the direction of Palm Beach Show group president and chief executive officer Scott Diament, the four-day fair distinguishes itself with a wide array of antique and estate jewelry and vintage timepieces offered by nearly 90 exhibitors from the United States and Europe. 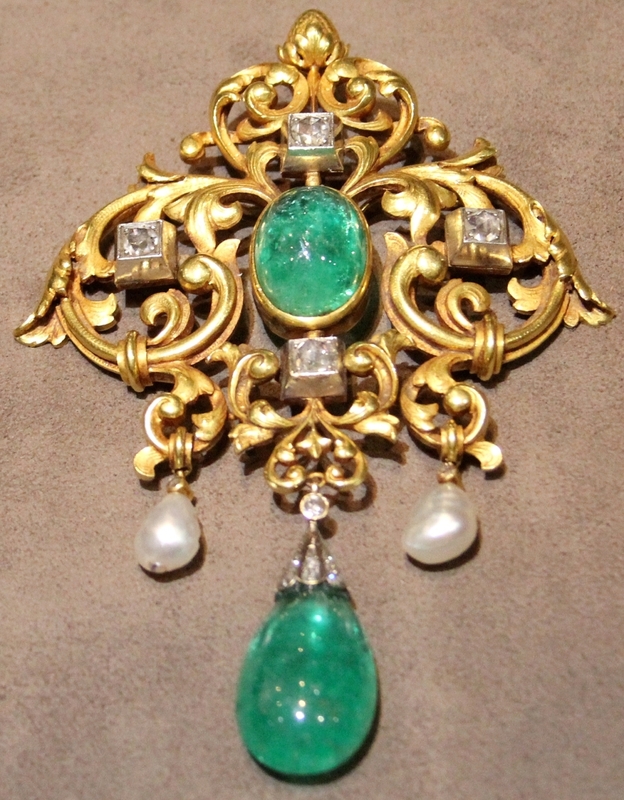 Though not the biggest part of the market, rare Nineteenth Century jewelry was plentiful. “Good is good,” Gloria Karp of Glorious Antique Jewelry in New York City boasted of her 18K gold Etruscan Revival necklace, maker unknown but probably Italian and made around 1870. Created in Paris around 1830 for a costume ball, a parure set with lapis, cornelian and other colorful stones beckoned visitors to Simona Gordon of London. A similar set from 1790 is at the Scottish national museum, the dealer said. “It’s probably English, very classical and in wonderful condition,” Swampscott, Mass., dealer Sandy Jacob told us, cradling in her palm an enameled Victorian pendant set with natural pearls. 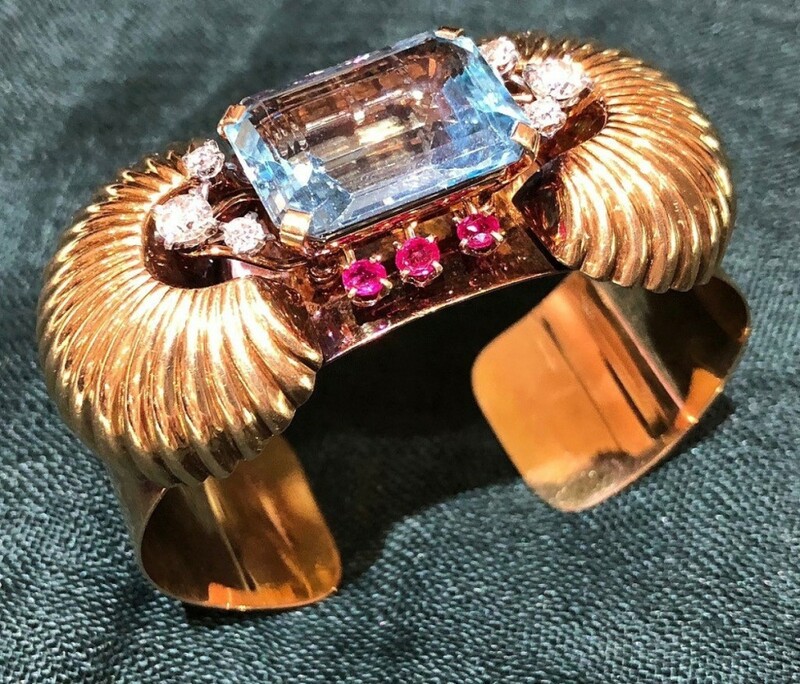 “We’ve always been interested in mourning jewelry,” Baltimore dealer Jackie Smelkinson explained of her extensive collection of historically interesting rings and pins. Many exhibitors featured Art Deco jewelry, perhaps the most popular collecting period. “Art Deco is my favorite style. It’s one of the best periods for jewelry design and craftsmanship,” Palm Beach, Fla., dealer Kris Charamonde noted, pulling from his case a delectable diamond and sapphire bracelet with matching clips. Onlyvintage, a watch dealer from Monaco, did steady business. At Windsor Jewelers of New York City, Allison Richman was at the ready with a pair of French clip brooches by Rene Boivin. Few firms are more admired than the American jewelry house Trabert & Hoeffer-Mauboussin, chronicled in a 2014 volume published by the Museum of Fine Arts, Boston. With pride, Alan and Janet Levy of the DeYoung Collection in New York City featured an exquisite Trabert & Hoeffer-Mauboussin pin and earrings made in the late 1930s or possibly early 1940s of moonstone, garnets, sapphires and gold. “From an investment standpoint alone, this is a very good buy,” Anshul Rakyan of the German firm Global Gems said, producing a ring set with cushion-cut diamonds around a rare 4Ã½-carat Kashmir sapphire. The handsome piece called to mind the engagement ring Prince William presented to Kate Middleton. “The workmanship is superb,” Zeisel Cohen of Cohen & Pariser in New York City said of a French-made Tiffany & Co. Schlumberger diamond and emerald butterfly brooch with blue guilloche enamel, circa 1980. A tour de force display of Danish silver, Art Nouveau to Modern, tempted shoppers at Greg Pepin of Hellerup, Denmark. The former managing director of silver at Georg Jensen in Copenhagen, Pepin dazzled buyers with flatware, hollowware, jewelry and decorative objects by Jensen and his contemporaries. On the day that Paul Newman’s Rolex Daytona wristwatch sold for a world record $17.8 million at Phillips, buyers – mostly youngish men – peered intently into glass vitrines of vintage timepieces. A mint and boxed Patek Philippe caused a stir at Onlyvintage, operated by Corrado Mattarelli of Monaco. “These truly become one-of-a-kind,” said Shahn Rosler of Gem De La Gem. From a cloud of brightly colored silks, the Teaneck, N.J., dealer unfurled an Hermes dip-dyed scarf created to celebrate the firm’s 80th anniversary. Rosler, who traveled to Washington, DC, for the Hermes promotion, was interviewed at length for a story in the Washington Post last summer. Gem De La Gem’s had several more cases crammed with coveted costume jewelry by Hermes, Chanel and other leading designers. The other notable player in the branded luxury goods space this round was Virgil Rogers of Only Authentics of Palm Beach. Rogers showed us some particularly delectable Chanel confections, among them a runway bracelet from the Byzantine collection and a handbag stitched with Chanel charms. The tiny talismans ranged from a miniature Eiffel tower to mock bottles of Chanel No. 5 and the company’s distinctive double-C logo. 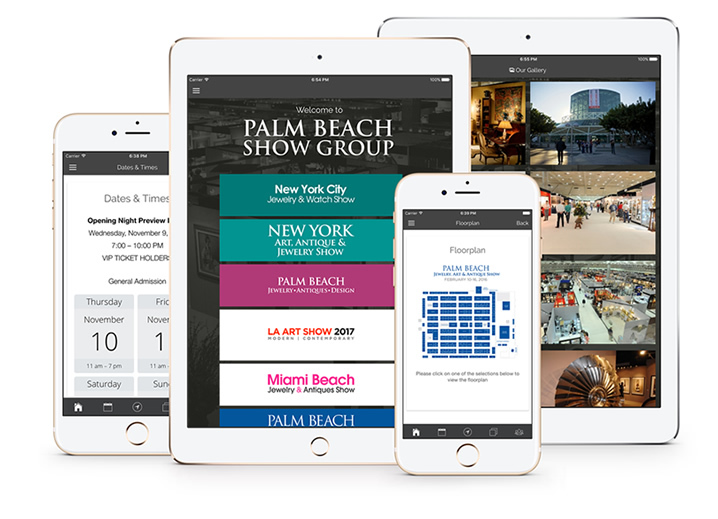 The Palm Beach Show Group works coast to coast, with a schedule that extends through the year. The promoter swings into high season on December 15-17 with the Palm Beach Art, Antique & Design Show, and kicks off 2018 with fairs in Los Angeles, Miami, Naples, Las Vegas and, of course, its flagship Palm Beach shows on successive weekends in February bracketing the President’s Day holiday. For additional information, www.palmbeachshowgroup.com or 561-822-5440.